BACTERIA are a mixed blessing. On the one hand, they plague us with diseases such as tuberculosis and leprosy and on the other, they provide us with such delights as curd and wine. Now, we have bacteria that are miners. In the past few years, these diminutive diggers have become the darling of the mining industry. For one, their mining methods are not offensive to the environment as are most other techniques, which use explosives, toxic chemicals and high temperatures (Science, Vol 264, No 5160). Biomining, as it is called, also makes for better economics, especially in extracting minerals from low-grade ores, which are being used increasingly because of depleting high-grade reserves. It improves recovery rates of minerals and reduces capital and operating costs. The first miners to exploit microbes, albeit unknowingly, were probably the Romans who worked the Rio Tinto copper mine in Spain 2,000 years ago. They noticed that the fluid running off the mine tailings was blue, an indication that it contained copper salts, from which they then recovered the valuable metal. However, not until 40 years ago did it become clear that the copper in the fluid was in fact the handiwork of a bacterium named Thiobacillus ferrooxidans. The tiny miner has proved to be a godsend for the copper mining industry, which has been left with the low-grade ores that need to be smelted more to produce the same amount of copper. With each new smelter costing $1 billion, the world is running short of smelters. 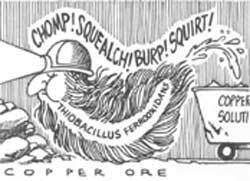 T ferrooxidans, however, can chew up the poor-quality ore which has been treated with sulphuric acid, releasing the copper that is collected in a solution at lower costs. Today, at least 25 per cent of all copper produced worldwide, worth more than $1 billion annually, is extracted using this bug. Of late, biomining has struck gold, too. With depleting high-grade reserves of gold, not only are these microbes cheaper to use than conventional energy-intensive techniques, they also increase the rate of gold recovery from 70 to 95 per cent. Phosphates have traditionally been extracted from ores either by burning them at high temperatures to yield solid phosphorus or by treating them with sulphuric acid to produce phosphoric acid. But last year, Alan Goldstein of California State University in Los Angeles and Robert Rogers of the Idaho National Engineering Laboratory in Idaho Falls evolved a pair of bacterial strains, Pseudomonas cepacia E-37 and Erwinia herbicola, which can remove the phosphate from the ore at room temperatures, without using corrosive sulphuric acid. Scientists are now trying to genetically engineer new bacterial strains that can stand up to toxic metals such as mercury and cadmium. However, genetically engineered microbes may take some time to materialise because scientists still know little about Thiobacillus and other bacteria used in biomining.